Name of two kings of Israel. The meaning generally attached to the name is "[he] strives with [oppresses] the people," or "the people strive," the root of the first element being taken to be (comp. Judges vi. 32). This equation, however, between "rub" and "rib" presents difficulties. Hommel ("Z. D. M. G." 1895, pp. 525 et seq.) holds "'Am" to be the name of a deity, and gives "'Am fights [for us]." Kittel ("Die Bücher der Könige," p. 99) suggests the derivation from "rabab" (= "to be numerous"), and proposes the rendering "the people, or the sept, is become numerous." This would necessitate the pointing "Yerubbe'am." Son of Nebat; founder of the kingdom of Israel; an Ephraimite of Zeredah, whose mother, Zeruah, is described as a widow. Jeroboam rebelled against Solomon, whose favor he had won by his industry during the repairing of the city wall and the building of the Millo. Though appointed by his royal protector overseer of "all the labor of the house of Joseph" (R. V.) he engaged in a conspiracy against him (I Kings xi. 26-28). 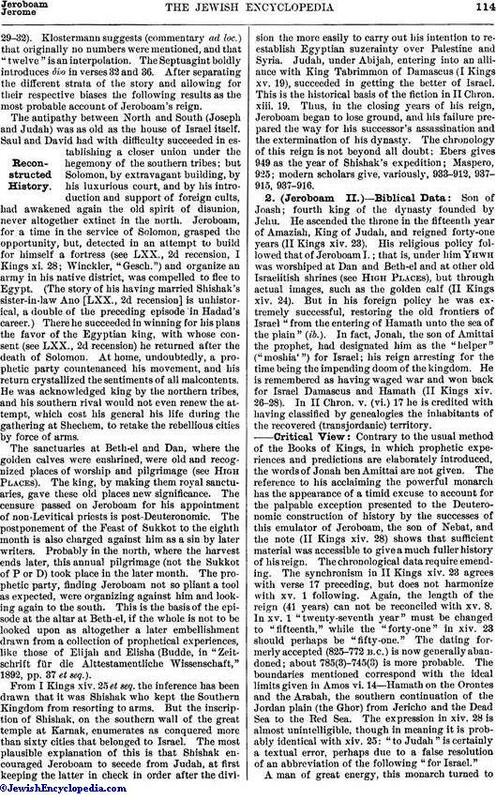 In this he was encouraged by the prophet Ahijah, the Shilonite, who, upon meeting the young conspirator, rent his new garment into twelve pieces, bidding Jeroboam take ten of them, thus symbolically announcing the division of the realm (as a punishment for Solomon's idolatry) and the appointment of Jeroboam to rule over the ten northern tribes, while one tribe (or two ? ), retaining Jerusalem, remained faithful to the house of David. Solomon, suspecting Jeroboam's loyalty, sought to kill him,but the conspirator succeeded in escaping to Egypt, where, under the protection of Shishak, the Egyptian king, he awaited the death of Solomon (I Kings xi. 30-40). When Rehoboam convened Israel at Shechem, after his father's death, to confirm his own succession to the throne, Jeroboam, apprised of what had occurred, returned. He seems to have been the spokesman for assembled Israel and to have represented their demands for relief from the "grievous yoke." Upon the refusal of Rehoboam to accede to their demands, and the failure of the attempt to coerce the complainants into submission, which led to the stoning of Adoram, the ten northern tribes asserted their independence by proclaiming Jeroboam their king, the prophet Shemaiah preventing any warlike measures on the part of Rehoboam (I Kings xii. 1-24; II Chron. x., xi. 1-4). Jeroboam selected Shechem for his capital, and fortified it and Penuel. To prevent his people from turning again to the house of David, he set up two golden calves, one in Beth-el and the other in Dan, on the plea that the pilgrimage to Jerusalem was "too much" for the people and that "these are thy gods, O Israel, which brought thee up out of the land of Egypt." Jeroboam also built altars on High Places, and appointed non-Levites to serve them; he changed the date of the Feast of Sukkot from the seventh to the eighth month; on the new date Jeroboam himself offered incense on the altar (I Kings xii. 25 et seq.). This act of his provoked a "man of God" to journey from Judah to Beth-el to cry out against the altar and announce that under Josiah its priests would be slaughtered. As a sign the altar would be rent. Jeroboam, in anger, stretched forth his hand, commanding his attendants to seize the prophet of evil, whereupon the king's hand was "dried up" and the altar was rent; the king recovered the use of his hand only by humbly imploring the prophet to restore it (II Kings xiii. 1 et seq. ; for the fate of this "man of God" see I Kings xiii. 11 et seq.). Jeroboam, undeterred by this incident, continued his policy of appointing priests regardless of their Levitical origin (I Kings xiii. 33). But when his son Abijah fell sick, Jeroboam sent his wife, in disguise, with presents to Ahijah the prophet, at Shiloh, to consult him concerning the child. Though blind, the prophet recognized her and announced to her the doom of the dynasty: the sick son of Jeroboam would be the only one of his house to come to the grave; all others would meet a violent death (I Kings xiv. 1-17). The account of this episode names Tirzah as the royal residence. Jeroboam became involved in war with Rehoboam's son Abijah, and was defeated, nowithstanding superior numbers and strategy. In consequence of this defeat several districts reverted to the Southern Kingdom. Jeroboam reigned twenty-two years (I Kings xiv. 20; comp. II Chron. xiii. 1). Jeroboam became for the rabbinical writers a typical evil-doer. This appears in the Septuagint (2d recension), where even his mother is represented as a disreputable woman. The name is explained as (= "one that caused strife among the people," or "one that caused strife between the people and their Heavenly Father"; Sanh. 108b). The name (Nebat) of his father is construed as implying some defect in his progenitor. Jeroboam is excluded from the world to come (Yalḳ., Kings, 196). Although he reached the throne because he reproved Solomon, he was nevertheless punished for doing so publicly (ib.). In the meeting between Jeroboam and the Shilonite the Rabbis detect indications of Jeroboam's presumption, his zeal for impious innovations (ib.). His arrogance brought about his doom (Sanh. 101b). His political reasons for introducing idolatry are condemned (Sanh.90). As one that led many into sin, the sins of many cling to him (Abot v. 18). He is said to have invented one hundred and three interpretations of the law in reference to the priests to justify his course. At first God was pleased with him and his sacrifice because he was pious, and in order to prevent his going astray proposed to His council of angels to remove him from earth, but He was prevailed upon to let him live; and then Jeroboam, while still a lad, turned to wickedness. God had offered to raise him into Gan 'Eden; but when Jeroboam heard that Jesse's son would enjoy the highest honors there, he refused. Jeroboam had even learned the "mysteries of the chariot" (Midr. Teh. ; see "Sefer Midrash Abot," Warsaw, 1896). 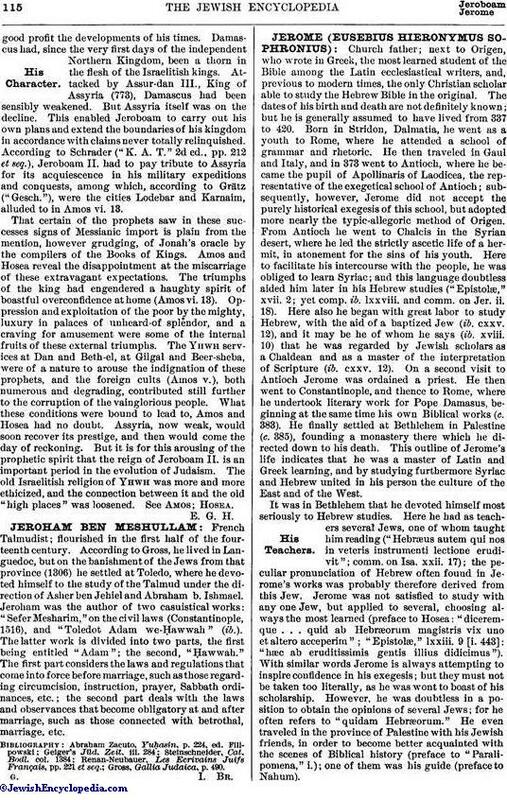 The account of Jeroboam's reign as contained in the First Book of Kings reflects the religious views of later, post-Deuteronomic times, though it is not altogether true that it is written from the Judean standpoint, as stated by Well-hausen in Bleek's "Einleitung" (4th ed., p. 243; Stade, "Gesch." i. 344 et seq.). The stress laid on the popular election of the king (I Kings xii. 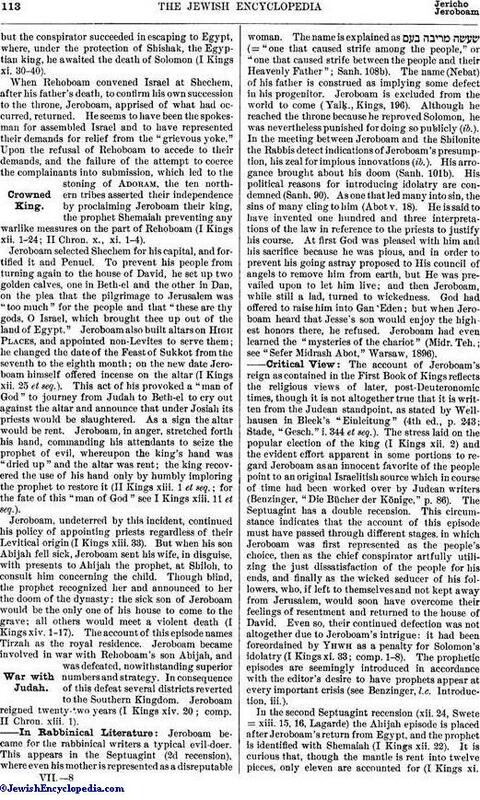 2) and the evident effort apparent in some portions to regard Jeroboam as an innocent favorite of the people point to an original Israelitish source which in course of time had been worked over by Judean writers (Benzinger, "Die Bücher der Könige," p. 86). The Septuagint has a double recension. 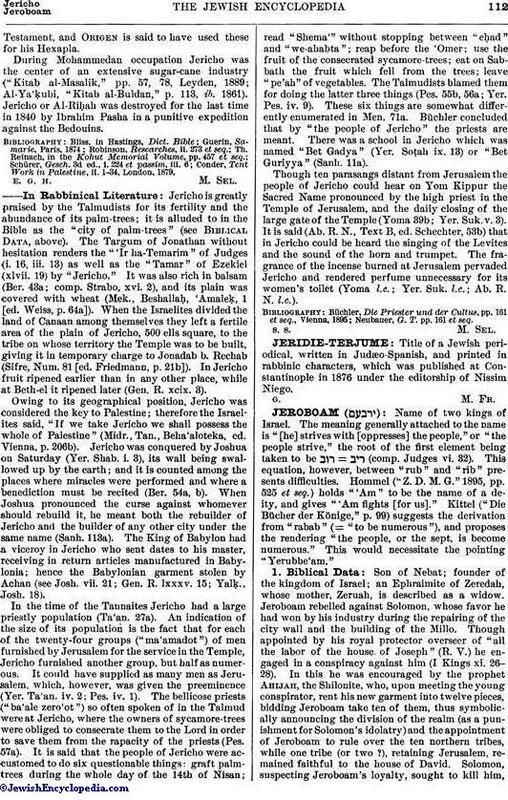 This circumstance indicates that the account of this episode must have passed through different stages, in which Jeroboam was first represented as the people's choice, then as the chief conspirator artfully utilizing the just dissatisfaction of the people for his ends, and finally as the wicked seducer of his followers, who, if left to themselves and not kept away from Jerusalem, would soon have overcome their feelings of resentment and returned to the house of David. Even so, their continued defection was not altogether due to Jeroboam's intrigue: it had been foreordained by Yhwh as a penalty for Solomon's idolatry (I Kings xi. 33; comp. 1-8). The prophetic episodes are seemingly introduced in accordance with the editor's desire to have prophets appear at every important crisis (see Benzinger, l.c. Introduction, iii.). In the second Septuagint recension (xii. 24, Swete = xiii. 15, 16, Lagarde) the Ahijah episode is placed after Jeroboam's return from Egypt, and the prophet is identified with Shemaiah (I Kings xii. 22). It is curious that, though the mantle is rent into twelve pieces, only eleven are accounted for (I Kings xi.29-32). Klostermann suggests (commentary ad loc.) that originally no numbers were mentioned, and that "twelve" is an interpolation. The Septuagint boldly introduces δύο in verses 32 and 36. After separating the different strata of the story and allowing for their respective biases the following results as the most probable account of Jeroboam's reign. The antipathy between North and South (Joseph and Judah) was as old as the house of Israel itself. Saul and David had with difficulty succeeded in establishing a closer union under the hegemony of the southern tribes; but Solomon, by extravagant building, by his luxurious court, and by his introduction and support of foreign cults, had awakened again the old spirit of disunion, never altogether extinct in the north. Jeroboam, for a time in the service of Solomon, grasped the opportunity, but, detected in an attempt to build for himself a fortress (see LXX., 2d recension, I Kings xi. 28; Winckler, "Gesch.") and organize an army in his native district, was compelled to flee to Egypt. (The story of his having married Shishak's sister-in-law Ano [LXX., 2d recension] is unhistorical, a double of the preceding episode in Hadad's career.) There he succeeded in winning for his plans the favor of the Egyptian king, with whose consent (see LXX., 2d recension) he returned after the death of Solomon. At home, undoubtedly, a prophetic party countenanced his movement, and his return crystallized the sentiments of all malcontents. He was acknowledged king by the northern tribes, and his southern rival would not even renew the attempt, which cost his general his life during the gathering at Shechem, to retake the rebellious cities by force of arms. The sanctuaries at Beth-el and Dan, where the golden calves were enshrined, were old and recognized places of worship and pilgrimage (see High Places). The king, by making them royal sanctuaries, gave these old places new significance. The censure passed on Jeroboam for his appointment of non-Levitical priests is post-Deuteronomic. The postponement of the Feast of Sukkot to the eighth month is also charged against him as a sin by later writers. Probably in the north, where the harvest ends later, this annual pilgrimage (not the Sukkot of P or D) took place in the later month. The prophetic party, finding Jeroboam not so pliant a tool as expected, were organizing against him and looking again to the south. This is the basis of the episode at the altar at Beth-el, if the whole is not to be looked upon as altogether a later embellishment drawn from a collection of prophetical experiences, like those of Elijah and Elisha (Budde, in "Zeitschrift für die Alttestamentliche Wissenschaft," 1892, pp. 37 et seq.). From I Kings xiv. 25 et seq. the inference has been drawn that it was Shishak who kept the Southern Kingdom from resorting to arms. But the inscription of Shishak, on the southern wall of the great temple at Karnak, enumerates as conquered more than sixty cities that belonged to Israel. The most plausible explanation of this is that Shishak encouraged Jeroboam to secede from Judah, at first keeping the latter in check in order after the division the more easily to carry out his intention to reestablish Egyptian suzerainty over Palestine and Syria. Judah, under Abijah, entering into an alliance with King Tabrimmon of Damascus (I Kings xv. 19), succeeded in getting the better of Israel. This is the historical basis of the fiction in II Chron. xiii. 19. Thus, in the closing years of his reign, Jeroboam began to lose ground, and his failure prepared the way for his successor's assassination and the extermination of his dynasty. The chronology of this reign is not beyond all doubt; Ebers gives 949 as the year of Shishak's expedition; Maspero, 925; modern scholars give, variously, 933-912, 937-915, 937-916. Son of Joash; fourth king of the dynasty founded by Jehu. He ascended the throne in the fifteenth year of Amaziah, King of Judah, and reigned forty-one years (II Kings xiv. 23). His religious policy followed that of Jeroboam I.; that is, under him Yhwh was worshiped at Dan and Beth-el and at other old Israelitish shrines (see High Places), but through actual images, such as the golden calf (II Kings xiv. 24). But in his foreign policy he was extremely successful, restoring the old frontiers of Israel "from the entering of Hamath unto the sea of the plain" (ib.). In fact, Jonah, the son of Amittai the prophet, had designated him as the "helper" ("moshia'") for Israel; his reign arresting for the time being the impending doom of the kingdom. He is remembered as having waged war and won back for Israel Damascus and Hamath (II Kings xiv. 26-28). In II Chron. v. (vi.) 17 he is credited with having classified by genealogies the inhabitants of the recovered (transjordanic) territory. Contrary to the usual method of the Books of Kings, in which prophetic experiences and predictions are elaborately introduced, the words of Jonah ben Amittai are not given. The reference to his acclaiming the powerful monarch has the appearance of a timid excuse to account for the palpable exception presented to the Deuteronomic construction of history by the successes of this emulator of Jeroboam, the son of Nebat, and the note (II Kings xiv. 28) shows that sufficient material was accessible to give a much fuller history of his reign. The chronological data require emending. The synchronism in II Kings xiv. 23 agrees with verse 17 preceding, but does not harmonize with xv. 1 following. Again, the length of the reign (41 years) can not be reconciled with xv. 8. In xv. 1 "twenty-seventh year" must be changed to "fifteenth," while the "forty-one" in xiv. 23 should perhaps be "fifty-one." The dating formerly accepted (825-772 B.C.) is now generally abandoned; about 785(3)-745(3) is more probable. The boundaries mentioned correspond with the ideal limits given in Amos vi. 14—Hamath on the Orontes and the Arabah, the southern continuation of the Jordan plain (the Ghor) from Jericho and the Dead Sea to the Red Sea. The expression in xiv. 28 is almost unintelligible, though in meaning it is probably identical with xiv. 25: "to Judah" is certainly a textual error, perhaps due to a false resolution of an abbreviation of the following "for Israel." A man of great energy, this monarch turned togood profit the developments of his times. Damascus had, since the very first days of the independent Northern Kingdom, been a thorn in the flesh of the Israelitish kings. Attacked by Assur-dan III., King of Assyria (773), Damascus had been sensibly weakened. But Assyria itself was on the decline. This enabled Jeroboam to carry out his own plans and extend the boundaries of his kingdom in accordance with claims never totally relinquished. According to Schrader ("K. A. T." 2d ed., pp. 212 et seq. ), Jeroboam II. had to pay tribute to Assyria for its acquiescence in his military expeditions and conquests, among which, according to Grätz ("Gesch. "), were the cities Lodebar and Karnaim, alluded to in Amos vi. 13. That certain of the prophets saw in these successes signs of Messianic import is plain from the mention, however grudging, of Jonah's oracle by the compilers of the Books of Kings. Amos and Hosea reveal the disappointment at the miscarriage of these extravagant expectations. The triumphs of the king had engendered a haughty spirit of boastful overconfidence at home (Amos vi. 13). Oppression and exploitation of the poor by the mighty, luxury in palaces of unheard-of splendor, and a craving for amusement were some of the internal fruits of these external triumphs. The Yhwh services at Dan and Beth-el, at Gilgal and Beer-sheba, were of a nature to arouse the indignation of these prophets, and the foreign cults (Amos v.), both numerous and degrading, contributed still further to the corruption of the vainglorious people. What these conditions were bound to lead to, Amos and Hosea had no doubt. Assyria, now weak, would soon recover its prestige, and then would come the day of reckoning. But it is for this arousing of the prophetic spirit that the reign of Jeroboam II. is an important period in the evolution of Judaism. The old Israelitish religion of Yhwh was more and more ethicized, and the connection between it and the old "high places" was loosened. See Amos; Hosea.